I have been binge-watching television series recently, ploughing through one series and then the next and the next. First it was my good standby, Dexter, then Homeland, with a few others in between. While these shows are entertaining, I found that something was missing. Each of these shows have strong female leads, albeit each with their own flaws, but where was the fashion? Where was the smart and capable leading lady with her own stellar style? And then, I started watching House of Cards. That's when my longing for a strong female lead with a great wardrobe was not only answered, but exceeded by the inimitable, Claire Underwood. In her, I found a female lead whose fashion sense actually enhanced her character, and let me tell you, the woman knocks it out of the park with corporate style. 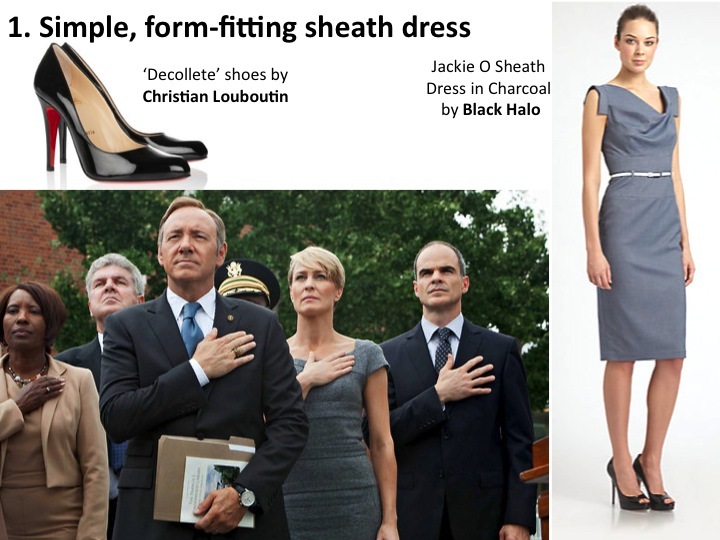 Claire frequently wears form-fitting sheath dresses that allow her to transition from the office to her husband's official political events with ease. Her taste for minimalism is appealing as she accessorizes with interesting necklines, rather than jewellery. Of course, running around from power meetings to her husband's award ceremonies means that Claire relies on a sturdy pair of black pumps. I'm convinced that we, as the viewer, are meant to see the red sole on the bottoms of her heels as she casually flicks them off in countless episodes. The devil may wear Prada, but Claire wears Louboutins. How to get Claire's look: A solid black pump may not be avant garde to the fashion world, but it is a style necessity for Claire. 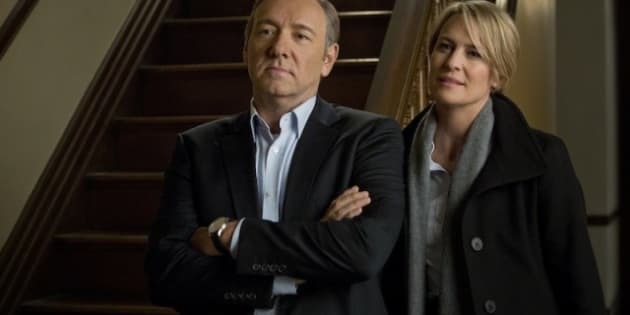 Find an sheath dress with an interesting feature, like an asymmetric neckline, similar to the one that Claire wore in the episode where they return to Frank's alma mater. 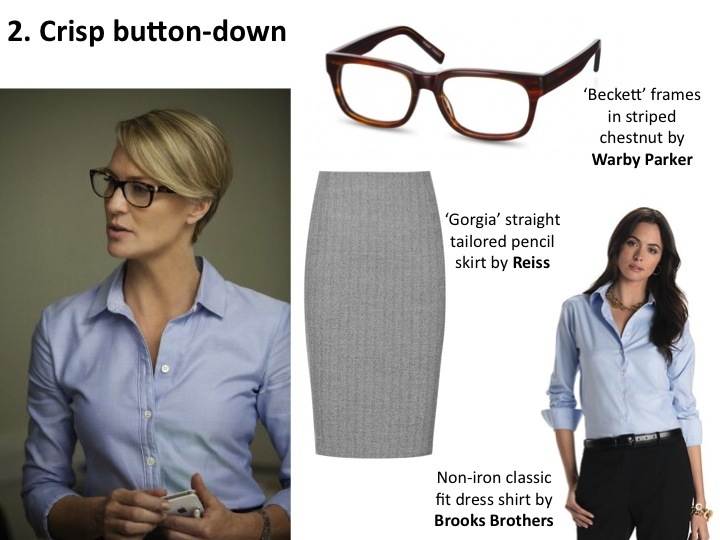 Claire gives a nod to menswear in a couple of episodes by wearing a crisp button-down shirt. An essential aspect of any corporate vixen's closet, her button-down shirt is fitted and tailored to fit her form. When Claire goes for the menswear look, she really goes for it with a complementary pair of dark frames, that only she is able to pass off as corporate chic, as opposed to trendy. How to get Claire's look: Choose button-down shirts that are fitted to your body and are not boxy. Balance them out with a classic corporate style piece -- the pencil skirt. A solid pair of dark-rimmed glasses complete the look. No one wears a coat like Claire. The woman could put on a windbreaker and still look incredibly important and stylish. She would never. Rather, the coats that she opts for throughout the series are simple, classic pieces ranging from a dark trench coat to a camel wool coat. In each case, they both look like they have been tailored to suit her, and quite frankly, they look expensive. How to get Claire's look: When it comes to proper, scene-stealing coats, you need not choose interesting styles or different colours. Claire demonstrates that classic shapes and styles are best so long as they are fitted immaculately to the body. Coats are items that are well worth the investment because it shows. House of Cards has me believing that every wife of a politician has an arsenal of cocktail dresses at the ready. In Claire's closet, you find simple strapless dresses in her characteristic form-fitting and neutral-colour style. That's not to say that her dresses are boring, when in fact, she knocked it out of the park in the episode where she just so happens to wear this to the same event that her incredibly handsome photographer ex-lover is also attending. That, my friends, is how 'effortless' is done in Claire's world. How to get Claire's look: It's really hard to get Claire's look when she looks so impossibly chic in this dress. But, for cocktail events, we can work from three simple rules: choose a style that shows off your most flattering features (which for Claire is her strong shoulders and defined collarbone), that hits you at an appropriate length for the event that you are attending, and most importantly, that you feel extremely confident in. 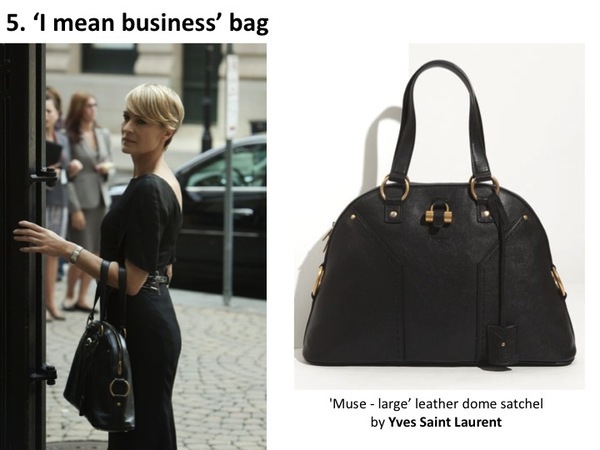 I have probably never wanted a bag more than after watching Claire so easily throw her dome shaped 'Muse' bag by Yves Saint Laurent on her desk at the office or slam it down on the coffee table at home. Being so casual with a designer bag means that it is easily replaceable for her, while others of us might treat it to its own chair at restaurants. Besides this apparent display of affluence, the bag with its heavy hardware and jet black leather shows us that Claire means business and makes me want it even more. How to get Claire's look: There's no easy way around this one other than to get a banging bag. One that works for your style, except, please treat it with care. After admiring Claire's wardrobe for an entire season, I've realized that a great deal of Claire's corporate style comes down to her attitude. She is incredibly confident in herself and she wears clothes that reflect this. She knows the colours, fits, shapes, and cuts that work for her and she nails them each and every time. If only the rest of us can be so consistent. Until then, grabbing a button-down shirt and some dark rimmed glasses is a pretty good place to start.